MR1395611 (97b:05139) Erdos, Paul(H-AOS); Janson, Svante(S-UPPS); \L uczak, Tomasz(1-EMRY-CS); Spencer, Joel(1-NY-XC) A note on triangle-free graphs. Random discrete structures (Minneapolis, MN, 1993), 117–119, IMA Vol. Math. Appl., 76, Springer, New York, 1996. MR0866355 (88b:60057) Jammalamadaka, S. Rao(1-UCSB); Janson, Svante(S-UPPS) Limit theorems for a triangular scheme of $U$-statistics with applications to inter-point distances. Ann. Probab. 14 (1986), no. 4, 1347–1358. MR0532251 (80f:62018) Kent, J. T.; Mardia, K. V.; Rao, J. S. A characterization of the uniform distribution on the circle. Ann. Statist. 7 (1979), no. 4, 882–889. MR1188488 Kent, John T.(4-LEED-S); Wright, Christopher(4-LEED-S) Some suggestions for transmission tomography based on the EM algorithm. (English summary) Stochastic models, statistical methods, and algorithms in image analysis (Rome, 1990), 219–232, Lecture Notes in Statist., 74, Springer, Berlin, 1992. Thanks for your interest in the Erdos Number Project. More very, very slow progress today on the Gavotte I from Lute Suite BWV 995. 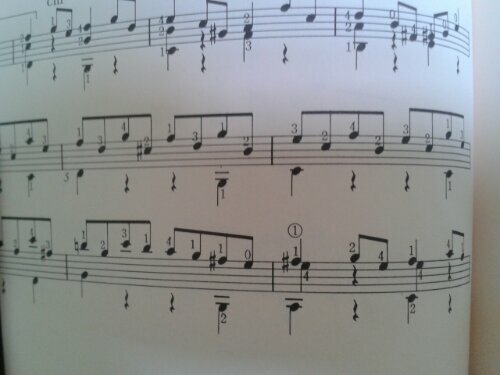 BWV 995 Gavotte I bars 7-8. 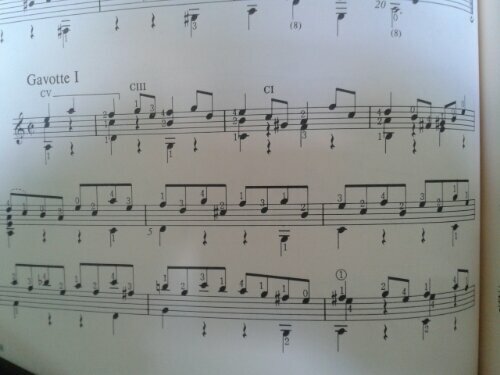 Bars 9-12 of BWV 995: Gavotte I. You are currently browsing the Chris1729's Blog blog archives for June, 2013.